The three highest priced homes for sale in Truro look an awful lot like Nantucket, but while they represent the high end well, Truro does have an incredibly diverse inventory of single family homes for sale in all price ranges. There are 60 houses on the market and 66% of them (40) are priced under $1M....23 of them are priced under $750K. There are 13 between $1M and $2M and 7 above $2m – three of which are shown here. 50 single family have sold year to date – 34 were priced under $1M and 16 were priced over $1M. The average sold price is $960K. 2 Mary’s Way – 9,570 square feet of luxury resort life. seven bedrooms and nine baths…on a 1 3/4 acre lot. It is being marketed at $4.995M. MLS Remarks: Rare opportunity to own this one of a kind seaside resort. Enjoy tennis, or a game of basketball? Then relax in the sun and take a dip in the ocean at the private association beach before lunch and a quick game of horseshoes. Catch dinner in the bay. After watching a spectacular sunset grab some popcorn and take advantage of the home theater. The present owner has thought of everything including a special expansive game room for rainy days. This set up gives family, friends and guests multiple options for relaxing, exercising and creating lasting memories. There are 22 parking spaces and a detached 3 car garage with upper level space for a gym and up another flight to conference room. Perfect for extended family or large family reunion gatherings. There’s no other property like this one! Listing courtesy of William Raveis Real Estate. 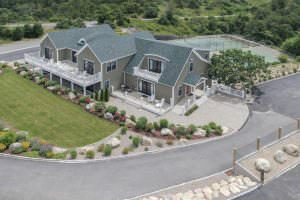 21 Crestview Circle is a four bedroom, six bath contemporary masterpiece in N Truro. It has 5,456 square feet and a private beach. It is being marketed at $4.950M. MLS Remarks – Modern Masterpiece. Logic, art & nature harmonize in a striking bluff-top dwelling overlooking Cape Cod Bay. Located in Truro on the Outer Cape, this 21st Century-Modern beach home is warm & comfortable…bold & avant-garde. Clad in luminous red cedar, the home’s horizontal, abstract lines embrace grand yet intimately scaled interiors that offer panoramic views of bay & coast. Graced by a natural palette of materials (limestone, honed granite, Tabu ash, walnut), accented by subtly rich colors & textures (chenille, faux suede) & powered by cutting-edge technology (Savant Home operating system), the home offers an unusual sense of comfort & well-being. 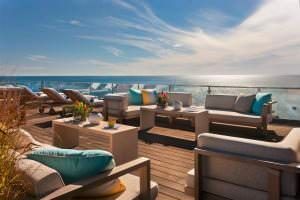 Superb views, private beach, unparalleled luxury. Harmonious master strokes of architecture, landscape & interior design have resulted in a bold & beautiful beach home that is in a class by itself. Listing courtesy of Robert Paul Properties. MLS Remarks: Overlooking the beautiful ocean on a sandy bluff sits this sophisticated waterfront home. Collaborative efforts have transformed this residence into a stunning modern oasis with 5000 sq. ft. and beautifully balanced living areas all oriented toward the water. A magnificent kitchen, dining, and great room anchor the home and access the wrap around deck. There is a mud room, home office, butlers pantry, laundry room and 2 story foyer that complete the main floor. The first floor master suite with a spa like bath showcase water vistas of the sea and beyond. The second floor features 2 bedrooms with ensuite baths, family room with private deck and den. There is a guest suite over the garage, inground pool and a private stairway to your own white sandy beach…the ultimate waterfront home. Listing courtesy of Robert Paul Properties.